What’s for dinner tonight? Or breakfast tomorrow for that matter? I’ve always got an answer in my back pocket when I’ve got a stash of flavor starter cubes in my freezer. My most recent batch came together after I found myself with an abundance of cilantro. Instead of letting it wilt away, I blended the leaves up with some garlic, salt, pepper, lime juice and olive oil and filled an ice cube tray with the mixture. The frozen cubes are a great way to get a quick meal started. Around our house, we use them most often to whip up a delicious batch of scrambled eggs that are anything but ordinary. Simply put the frozen cube in your skillet, heat and let melt. 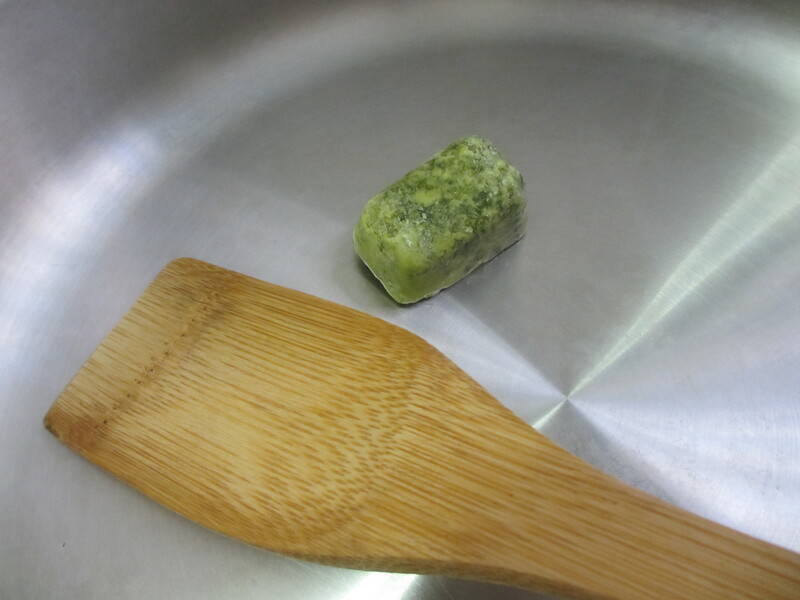 Once it’s melted, swish the herb and olive oil mixture around your pan and add eggs. Cook your eggs as you normally would and you’ll enjoy a refreshing flavor that goes way beyond just seasoning your pan with a bit of butter or oil. In addition to eggs, you can use flavor starter cubes to season a pan before searing chicken or cooking up some vegetables. I’ve even used one to add a little something extra to a classic grilled cheese. 1. Place the garlic in a blender or food processor. Pulse until well chopped. Add the cilantro, lime juice and olive oil. Blend until well combined, adding more olive oil if necessary to get a liquid consistency. Add salt and pepper to taste. 2. 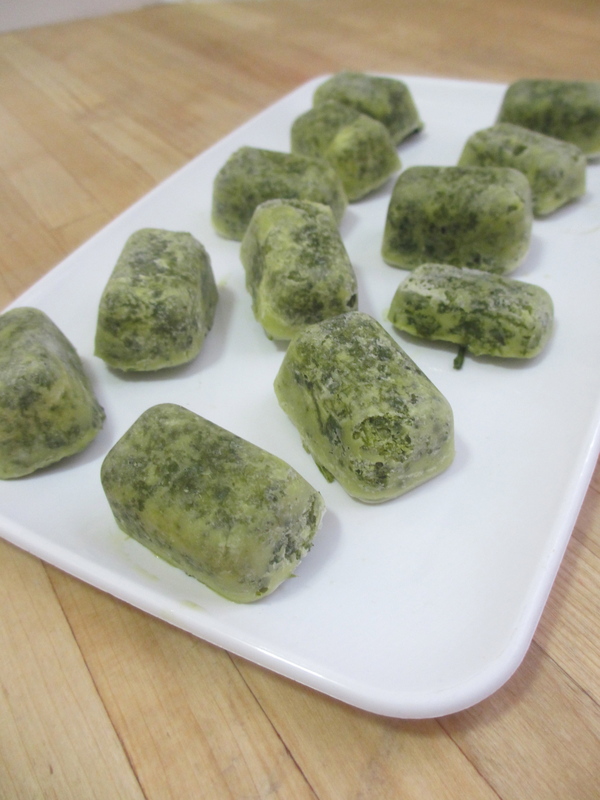 Pour herb mixture into an ice cube tray. Freeze then transfer cubes to a zip-top bag for extended storage. SWWU Tip 1: I don’t always fill the each well of the ice cube tray to the top. Smaller cubes are great when you’re making something for one person. Experiment making your cubes different sizes and see what works well for you. SWWU Tip 2: Have other herbs on hand? This recipe works equally as well if you substitute parsley, basil or more. The lime juice can be substituted with lemon juice or left out entirely. This entry was posted in In the Kitchen and tagged @SWWUblog, basil, chicken, cilantro, dinner, DIY, eggs, fresh herbs, frozen, in the kitchen, parsley, quick and delish, quick dinner, quick trick, storage, tip, vegetable side by Something We Whipped Up. Bookmark the permalink.